Life is full of big investment choices. Should you buy or rent? Save in a 401(k) or Roth IRA? Matriculate on in-state tuition or take on out-of-state debt? Magic and Modern are supposed to be our hobbies and our break from all the real-world weight of the workplace and your bank account. But when it comes to investing in a deck, it doesn’t always feel that way. In fact, with a format as complex and potentially expensive as Modern, it can sometimes be more stressful than all those non-Magic financial decisions. No one wants to spend too much money on their Modern deck, especially if the deck is in danger of a ban, not fun to play, or worst of all, just plain bad. Today, I want to introduce a strategy that can help you make smart financial decisions in Modern to save your bank account, your tournament performances, and potentially your relationships (because spending $800 on 4 “pieces of cardboard” can be hard to justify to the Mr./Mrs. in your life). Modern investment is partially an inexact science. When selecting a deck, you need to follow your gut, your playstyle, and what “feels” right to you. But like with most things on Modern Nexus, there’s a method and data-driven approach that can underlie your decision. In this article, I compare the cost of key tier 1 and tier 2 Modern decks with their win rates as calculated in our MTGO Deep Dive dataset. Our goal is to see which decks have the most favorable cost to win-rate ratio. That is, which decks will take your money the furthest in tournaments / what gets you the best return on your investment. Although this should not be your only approach to Modern investment, it’s a great starting point if you aren’t sure where to start or where to go next in the format. It’s also an interesting exercise in how to make financial decisions in Magic. Since Magic started, many players have suggested you need to buy your way to victory. Let’s actually put that to the test in Modern. Just because a player is budget-minded, doesn’t mean they want to, or even need to, play a “budget” deck. To some extent, “budget” has an unnecessary stigma to it suggesting budget decks can’t be good. There’s some fact and fiction to this, but for this article, it’s important to consider affordability as just one piece of the puzzle. Deck performance needs to be another. People don’t just want to enter Modern to win their local FNM or take down a Daily every now and then, they want a deck they can bring to PPTQs and GPs, a deck they can grind into the digital dust on MTGO. So I don’t want to focus on the historically “budget” decks, things like Mono Green Stompy or Mono Black Midrange, or really anything without Goyf. I want to focus on the real tier 1 and tier 2 decks of the format. These are the heavy-hitters players need to choose from whether they are new to Modern or are Modern veterans just looking to switch decks; these are also the first decks new Modern players see (think Twin, not Slivers), and the ones they are most likely to investigate when gearing up to make the big purchase. Looking at the recently updated Top Decks page, i selected a number of decks that are both tier 1 and tier 2, and also have sufficiently large representation in the MTGO Deep Dive dataset. This dataset draws MTGO data from the client to calculate the “true” Match Win Percentages (MWPs) of decks. It doesn’t look at just the publicly published 4-0/3-1 finishes. Instead, it looks at all finishes from a sample of dailies over a time frame. Although it’s just a sample and not the full population, that dataset still gives us access to the best (to my knowledge) estimators of deck’s MWPs in Modern. Because we are ultimately comparing price to MWP, we need to only look at the decks with a big enough N in the dataset to give a robust MWP calculation. With that in mind, here are the decks we will be looking at today. I’m breaking them out by their current tier, and then giving a few key data points on each deck. First, I’ll give the TCGPlayer NM/Lightly Played cost of that deck (including sideboard! Never forget the sideboard!!). Costs were computed using the TCGPlayer mass product entry tool and their cart optimizer and then rounded to the $.50. Then I’ll link to a representative decklist from the past 1.5 months (the highest finish at the largest event in the range). Finally, I’ll end with their metagame share. Note the awesome Abzan Company was excluded from this analysis for lack of datapoints in the Deep Dive dataset. Hopefully we’ll have more on that soon! Otherwise, this is a pretty comprehensive cross-section of the metagame. With the costs all laid out, let’s plug those into the second part of our analysis and see how the decks stack up. One thing we always talk about in fundraising is showing the impact of your dollar. This “return on investment” applies just as much to funding a social service program or other nonprofit as it does with Magic decks. Now that we know how much each deck costs, we can compare those prices to the MWPs of those decks. We can use this analysis to see which deck has the most favorable ratio of MWP to cost, i.e. the best return on investment (ROI). Instead of expressing the deck value as just the MWP divided by the cost, I want us to think of it in terms of these ROI-style numbers. That is, when you invest in a deck, what is the MWP return on your dollar investment? I’m going to show this in two ways. The first is as a straight ROI calculation: how much MWP does your $10 buy in that deck (I’m using $10 instead of $1 because it makes the percentages larger and clearer)? The second is as a kind of reverse ROI calculation: how much do you need to spend on the deck in order to buy 1% point of MWP? These two parallel numbers give you two different ways of understanding the cost to MWP ratio for each deck. Let’s see how this works out with our tier 1 and tier 2 decks! Again, MWP values are taken from the Deep Dive dataset, which you can read more about in this article. Just to check our understanding, here’s how to read each entry in the sortable table. Affinity costs $646 and has an MWP of 52.7%. That means for every $10.00 you invest in Affinity, you are “buying” .82% points of MWP. Or stated differently, the cost of a single % point of MWP is $12.30. By contrast, Abzan costs a walloping $1,691 and has a slightly higher MWP of 53.3%. So for every $10.00 you invest in Abzan, you “buy” just .32% points of MWP. The cost of a single % point of MWP in Abzan is $31.70. Purely based on these numbers (and again, there are other factors in deck investment beyond these numbers), your Affinity investment has a higher ROI. The interesting thing in this analysis is the relative narrowness of MWPs and the huge range of costs. Most decks are hovering around an MWP of 50%, with some outliers on the lower and and the higher end (get ’em Amulet!). But costs are all over the place. Merfolk is cheaper than many Standard decks with a pricetag under $450. Abzan and Jund cost more than 2 months rent in many cities, at $1500+ each. So it makes sense as price climbs, the investment becomes a lot worse in terms of MWP. Before wrapping up, I want to highlight the decks with the top 3 ROI values in this analysis. You can see them in the table above, but I want to say a few words on them, why they are good investments, and what you should consider before investing in them just based on the MWP/Cost analysis we did here. In many respects, this gets at all the other considerations that need to go into deck investment beyond just MWP and cost. I’ve made it no secret in the past: I think Amulet Bloom is the “best” deck in the format. It has the highest MWP by a huge margin, had the highest MWP at the Pro Tour, has an insane ratio of T8 finishes to Day 1 showings at major events, and in practice, is one of the hardest decks to play against and interact with. It’s a really, really good deck. As this analysis shows, Amulet is also a really, really good investment. For just $573, you get to play the “best” deck in the format. Take that, you $1,500+ Abzan/Goyf/Lily players! Before you hop onto your vendor of choice and add this baby to your cart, there are a few important Amulet Bloom issues to keep in mind. First, the cards have very little overlap with other decks. If you spend $573 on Amulet Bloom, you really are just spending $573 on Amulet Bloom alone: it’s not like you can sleeve up your cards in some other deck, as opposed to something like Twin or Scapeshift. Moreover, and this brings us to the second consideration, your investment is going to tank if Amulet Bloom ever eats a ban (which will probably be on Summer Bloom. Although the deck probably survives without Bloom, it will definitely be worse, which can make this a high-risk, high-reward investment on its own. As a final consideration, Amulet Bloom is as dedicated a combo deck as they come in Modern. Be ready to commit time to practicing the deck and learning how to win with it. Also, to knowing how to play it in various matchups. With a deck like Burn, you will need some practice, but to a greater extent you can just sleeve it up and launch headlong into a tournament. Do that with Amulet Bloom and you will be lucky to be up one match by four rounds in. That is also to say, Amulet comes with a time investment on top of a monetary one, so bear that in mind when making your purchase. I would have been worried about the validity of this analysis if Burn didn’t make the cut. Burn has made a name for itself largely because players believe it has the best tier/performance to cost ratio. This analysis basically confirms that. When you invest in Twin, Abzan, and Jund, you are spending lots of money for a pretty decent deck. When you invest in Burn, you are spending way less money for a slightly better deck. Burn is as linear as it gets, and that’s reflected in its slightly higher MWP relative to the other tier 1 decks. Proactive strategies are where you want to be in Modern, and Burn wrote the playbook on being proactive in any format, let alone this one. 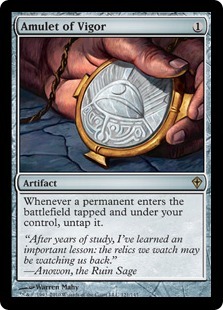 Unlike Amulet, Burn is a “safer” investment in terms of time commitment, bannability, and playstyle. You don’t have the same crazy MWP as Amulet, but you have a deck that’s much easier to play (not “easy”, but “easier” than Amulet), and a deck likely to be around for as long as there’s Magic. Your Burn investment will even overlap to other decks (and formats, e.g. Legacy), both in the fetchlands and some of your burn spells and creatures. Even if the overlap isn’t as much as a deck like Twin, you’re still getting cards like Helix, Bolt, fetchlands, shocklands, etc. that will apply elsewhere. It’s possible, but unlikely, Burn eventually eats a banning for being too efficient, or gets slapped down with some scary new hate card printed in an upcoming set. But the deck will still be viable and you will still be playing Modern’s premier aggro deck. It’s also a deck that should be relevant in most metagames, because you can almost always catch opponents by surprise if they are under-prepared for your speed. Overall, Burn is just as good an investment in this analysis as many players believe it to be. I always knew Merfolk had a favorable cost to performance ratio, but it wasn’t until after I conducted the analysis I saw how good it really was. At an easy $446 investment, Merfolk is the hand’s down winner of the ROI analysis. Merfolk has no fetchlands, no shocklands, no expensive staples, and no fancy niche cards that weren’t reprinted by those Wizards jerks in MM2015. It’s just pure, old-fashioned Fishy beatdown goodness at a discount. Like Burn and Amulet, Merfolk is as proactive as decks get in Modern (I hope you are sensing a pattern here). Unlike Amulet, the deck takes way less time to familiarize yourself with, and doesn’t require a love for potentially less-interactive combos and Magic. And unlike Burn, there is absolutely no chance Merfolk ever eats a ban, and absolutely no chance you get beaten up behind your gamestore for being the scumbag who wins with Burn every FNM. There is very little overlap between Merfolk and other decks, so that’s something to consider when shelling out your $450 for the blue men group. That said, Merfolk has always been present in Modern, either leaping into tier 1 or swimming around in tier 2. This makes it an extremely safe investment, regardless of the metagame context. The deck is also pretty easy to modify, splashing (bahaha) for different off-color bullets (e.g. Path to Exile and Thoughtseize), or for non-blue synergies (e.g. Collected Company). This ensure you have plenty of room to grow into your deck and stay relevant as the format expands. So if you are pressed for cash or just want your dollar to go a long way, it doesn’t get better than then $10/1.24% MWP ratio of time-tested Merfolk. As I’ve said more than a few times in this article, the MWP:Cost ratio is just one of many datapoints you need to consider when making your Modern investment. In particular, here are three other important concepts you need to think about before spending money. Playstyle: Astute readers will notice all of the best investments are aggro or combo decks. Where’s the midrange? Where’s the control? Indeed, the absence of control is a much larger issue in Modern (depending on what perspective you approach it from), and this investment analysis just reinforces that divide. When investing in a deck, make sure it’s something you can see yourself playing for at least a year. If you have more disposable income than the average player, you can probably discard it sooner than that. Adults with stable jobs will find Magic is a lot cheaper after college than before or during it. And even if you are operating on a smaller budget, it just takes a few months of saving to get your dream deck. But even so, always playtest a deck before buying it to make sure you actually enjoy what you are playing. Banning: I know a lot of Modern players who are scared to invest in decks for fear of a banning. This is mostly Wizards fault for having bad communication on their ban policy, and for mismanaging expectations around the format. It’s a real disappointment this is even a factor in investing, and Wizards needs to do something about this for the long-term health of Modern. I could write a whole series of articles on this mismanagement, how to fix it, and how it affects player decision making (particularly around deck purchases). But for now, I will only say this: don’t worry about bans. Magic is a game and if you are reading this article, you are probably playing Modern because you love the format. Invest in the deck that gives you the most enjoyment and you will always win, even if the deck is ultimately banned. Besides, as both the rise of Grixis Delver and Abzan Company attest, a banned deck is almost never a dead deck. Pod never died, it just took a break. Even if Twin got banned tomorrow, you would still have a UR core that would translate into plenty of other viable decks. So never be afraid to invest based on ban danger. Between the other cards you buy and the fun you have, it will always be worth the investment. Card overlap: Sean touched on this in an earlier article, but I want to reinforce this point here. When you invest in a deck like Merfolk, you are going all-in on that deck. But when you invest in a much more expensive deck like Abzan or Twin, you are obtaining a wealth of staples crossing over between decks and even formats. If you are the kind of player who sticks to a deck until Wizards pries it from your cold, dead hands, then don’t worry about card overlap. But if you are the kind of player who shops around and switches things up depending on metagame context, look for deck/card overlap. There are plenty of other investment considerations out there (metagame context, making a long-term profit, cross-format applicability, etc. ), but these are great entry points to get you thinking about all the different factors affecting your investments. This includes the MWP analysis, which is just one data point you should consider in making your Modern purchases. So get out there, put down some cash, and buy into the Modern deck of your dreams. Well, gratz on the article. But it is a certain thing I do not get.It feels almost like you think is fair for the ‘Summer Bloom’ cards to get banned. And moreover, you are stating ,dear Sheridan, that the archetype may function after the ban. And I dare saying that this is not the first time I read that. Well, the truth from my perspective is that with Hive Mind or Simian getting banned, the deck can continue on.But with either Amulet or Bloom ban, I am certain that the deck will get completely shut down. Anyways, I don’t think it ll get banned as it has no consistent turn 2 or 3 kills on it. Great article except for this one I believe. Congratulations for one more time. Sorry if this wasn’t clear. I definitely don’t think Bloom should be banned and I also don’t want ANYTHING banned. But I also want to give full information to my readers, and based on what Wizards has done in the past, the Bloom ban is the likeliest IF something from the deck does get banned. Do I want it to happen? No way. Do I think it will happen? Right now, no. But if something does get banned from that deck, I think it will be Bloom and I want readers to prepare themselves for that. Honestly, I would like Wizards to either ease up on the banning and to be more transparent about the whole process. Until that happens, however, I want players to be prepared for worst-case scenarios. I think it’s perfectly fine to warn people about Amulet Bloom. It does violate the Turn 4 rule. There is no discussion to be had there. The only thing that matters is if Wizards thinks that is happening too often or not. You don’t want to get caught with your pants down when a banning does happen because you invested into a deck that has almost no staples in it that you could use in many other decks. Of course dear Galerion I agree with you. But the thing is that with a Simian Spirit Guide ban IF they wanted to ban it, turn 1 kill becomes impossible and turn 2 kill becomes immensely hard to be dealt. One thing to point out about Modern fish is that it transforms into Legacy fish pretty easily, and is as serious contender in Legacy as it is in Modern, which just drips value. Switch out 10-15 cards of the 75 and you can play multiple formats. This is also true of Burn. I am glad to hear that. And I can fully understand the latter statement of yours dear Sheridan. Well, the Summer Bloom is the engine that cracks up the engine for the Amulet Bloom combo so I can understand that. The fact is though, that if Wizards decide to ban something they should not look beyond Simian Spirit Guide and that is because without it there are no more T-1 kills, although this was 0.05% likely to happen in each game. Anything beyond that is pure mistake and should lead to more players(like me of course) to look away from this format. And right now, the meta is fantastic so it all can work out perfectly. The BEST SOLUTION however would be to power up some decks that have been aside for some time now, and maybe one or two that can look Amulet Bloom deck in the eyes. Thanks for your answer and your article. On the plus side – Merfolk gets you close to a function Legacy deck. Short of Force of Wills mind you. Nice analysis. I’m not surprised to see the top 3, though I am a bit surprised that my favorite deck (Merfolk) snagged the #1 spot. I know that less played decks (such as the ones that round out the rest of your Tier 2) have a less reliable MWP%, but maybe it would be worth taking a look at those as well? I think that if you take their win rates with a healthy grain of salt, you might come up with a deck that can hang with the MWP ROI of some (if not all) of the decks here. That’s actually the plan. I’m adding more dailies to the dataset to see if we can increase any of those N’s, but once we do, expect to see some new articles on it. Really good article – thanks. Its articles like these that have made this relatively new website become worth a daily visit for me. I am a new but enthousiastic modern player, on a splurge I just finished building B/W tokens and Merfolk. But very fun and somewhat dissimilar dekcs, and I am now feel more than validated in my choice after reading this article when at least one of the two decks is such a top performer. That said, shoktroopa has had that many results in daily events that I can’t help but think there must be something there. The MWP issue with Mono U Tron is that it’s artificially brought down by newer players. The players who go 4-0/3-1 with it are good pilots who know their stuff. Their win rates are quite strong. But the players who go 2-2 or worse are disproportionately bringing down the MWP because they are so new to the format. It’s actually an interesting effect because you don’t see it with a lot of other decks. I fell like starting at 0% for win percentage isn’t really the right way to go about finding the most cost effective deck. I bet you could build some mono red junk commons deck for like 8$ that could win 3% of its matches (for example I beat pod 1 game out of 3 with mono red heroic from when ktk came out), but that deck would be a terrible investment. Entering a tournement with a 20% win rate you might as well not enter at all. I think taking the win percentage above some base number would give more meaningful results, but I have no idea how to chose that base. What exactly differentiates tier 1 from tier 2? None of the finishes cited for tier 1 decks are 1st place finishes, yet for 4 of 6 tier 2 decks you are showing 1st place finishes. Tier 1 and 2 decks are defined on the Top Decks page (http://modernnexus.com/topdecks/). In essence, decks are tier 1 if they comprise a significantly above-average segment of the metagame. Decks are tier 2 if their prevalence is above average, but not as high as those in tier 1. This accounts for MTGO dailies/MOCS/PPTQ events, all paper events, and also any major paper events (e.g. Grand Prix or Pro Tour) finishes in the date range. Because we are in an offseason, the most recent “major paper event” was in late February (SCG Baltimore), so we are using weighted numbers from that tournament. All the other finishes are from the hundreds of other events that happen in any given date range. i am a new MtG player. i started with standard with Jeskai and Atarka Red Decks. a few weeks ago, i had an urge to try modern. since i already have Monastery Swiftspear, Eidolon of the Great Revel, Wooded Foothills and Atarka’s Command, i decided to make a modern burn deck. i was not sure if going burn was the right decision for me, but after reading your article, i feel satisfied of my choice. i just checked Legacy tournaments and to my surprise there’s also Burn there with pretty much the same cards. i made the right decision by going with Burn. Is there a more… Modern one? (ha! Silly pun). Did someone do an analysis of the 2017 meta?